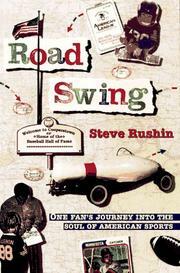 It is unfortunate that Rushin’s often sophomoric sense of humor intrudes on an otherwise engaging and astutely observed odyssey of the rich variety of American sports, major and minor. A Sports Illustrated staffer for 10 years, Rushin covered 23,000 miles —to revisit the twin pursuits of my youth: epic car trips and unhealthy obsession with sports.” On his trip, grazing at the “endless salad bar of American sports,” he caught everything from amateur softball games and 9-ball tournaments to the NBA playoffs. He included numerous “local shrines,” such as Larry Bird’s hometown of French Lick, Ind., the field used in Field of Dreams in Dyersville, Ia., and the town of Jim Thorpe, Penn. At a Chicago Bears training camp, “a whiff of the Porta Potties— sets off a Proustian wave of nostalgia for high school football games, though he is seriously moved by the tears of Lou Groza and the anger of Dante Lavelli, veterans of the glory days of the dearly departed Cleveland Browns. As Rushin’s tour progresses, he visits the obvious: baseball’s Hall of Fame, Augusta National Golf Club, the Talladega National Raceway, Churchill Downs, the Houston Astrodome, and Dodger Stadium (though primarily for the hot dogs). But he also hits the not-so-obvious: St. Louis, where the Anheuser-Busch brewery and the Bowling Hall of Fame “stand as twin monarchs to keggers and keglers”; the Mildred (Babe) Didrickson Zaharias Museum in Beaumont, Tex., and the Louisville Slugger plant, which is actually located In Indiana. All of this is great fun, and Rushin can be a sharp, sometimes quirky tour guide, e.g., his side trip to Las Vegas to view Andre Agassi’s ponytail on display in a restaurant. But he can’t resist spiking his good work with repeated awful stabs at humor: losses for the University of North Carolina women’s soccer team (284—6 since 1981) “were as irregular as Rose Kennedy.” “The air was warm and heavy and foul, like God’s halitosis,” he writes elsewhere, and he has a bit of scatalogical fun with Michael Jordan’s having —released his own fragrance.— Too bad in a a volume that often offers moments of (Thomas) Boswellian sagacity.